Has the role of atmospheric dust as a control on productivity in oligotrophic regions been overestimated? Dust particles settling into the surface of open ocean environments are for years assumed to provide nutrients to these distant nutrient-limited areas. Torfstein and Kienast (2018, see reference below) present a unique high-resolution coupling between dust concentrations (hourly resolution) and chlorophyll-a concentrations (daily time scale resolution) across a 4-year period in the deep, nutrient-poor water column of the north Red Sea, which seriously questions this hypothesis. This long time series study reveals that there is no correlation between dust and surface chlorophyll-a concentrations, regardless of the time of year, or the possible lags between the dust settling and the oceanic response. The authors conclude that the role of atmospheric dust as a control on productivity could have been previously overestimated. 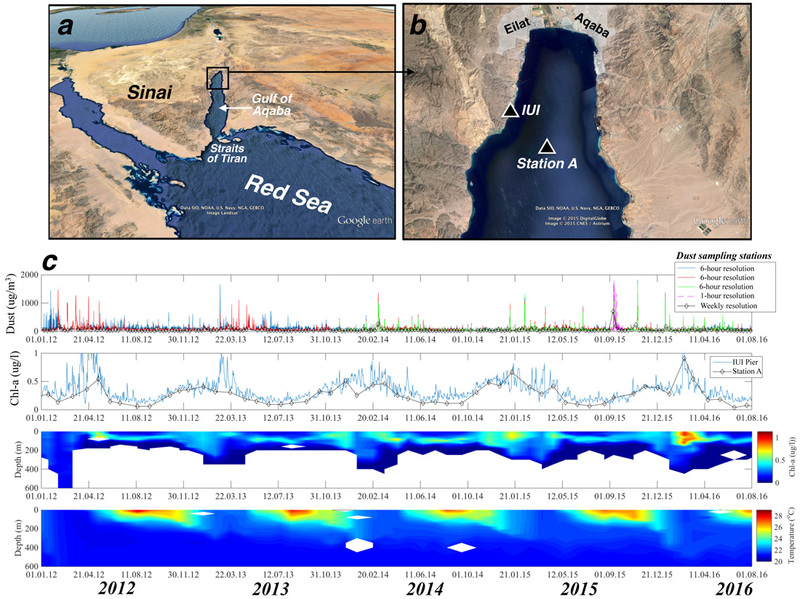 Figure: The study took place in (a) the Gulf of Aqaba, northern Red Sea, and combined monthly and daily resolved records of chlorophyl-a concentrations sampled at (b) the Interuniversity Institute for Marine Sciences (IUI) and station A (29°280N, 34°560E, water depth 700 m), respectively. The distance between the two sites is approximately 4 km. Dust time series were recorded at the IUI and its vicinity at weekly, daily and hourly resolution. (c) A comparison between water temperatures and vertical chlorophyll-a (chl-a) concentrations at station A (monthly resolution), daily and monthly chl-a surface concentrations (μg/L), and dust concentrations (μg/m3) at a weekly, 6 hour and 1 hour time resolution, between January 2012 and August 2016, imply that no statistically significant correlation exists between dust patterns and chl-a concentrations. Click here to view the figure larger.